Vävstuga Weaving School has recently announced they are accepting applications for Väv Immersion III. This textile opportunity of a lifetime will be held August 12, 2019 – November 22, 2019 in Shelbourne, Massachusetts. It is a great way to say, “I love you” to yourself. So, in honor of Valentine’s Day, I’m sharing with you one of the best gifts I’ve ever given to myself. Students 35 and under are eligible for scholarships through the Ddora Foundation. Students over 35 – if you need a little financial boost and are a member of the Handweaving Guild of America, consider applying for one of their grants , the deadline of March 1st. If you are a member of another textile organization or local weaving guild, they too might have grants to support you. Consider creating a fundraiser, offering your own handwoven goods as a thank you. The Väv Immersion early deadline application is just around the corner – March 1st – and the regular application deadline is May 15th. When you give yourself this gift – from rag to rug, thread to tablecloth, and yarn to blanket – you will be in delight! It is a fabulous way to love yourself! I’m in the process of taking several weaving projects from Vävstuga Basics and Väv Immersion and bringing them alive. These items have been sitting on a shelf and it’s time to awaken them! They are samples, learning pieces, they are not perfect. These items show my humanness, and I’ve decided to embrace them and their/my imperfections. The blue and white Damask square woven at Vävstuga Basics in 2013 was not quite large enough to cover the 22 inch feather pillow form, so I went to my stash of no longer worn clothes and found a long ago favorite off white dress with a beautiful weave and fabric covered buttons. I hand sewed the Damask onto the fabric and then created the pillow case, making it 2″ larger than the form to fit just right. However, it is a bit too big and saggy. Do I make it smaller, get a new form that is fuller or just live with a little sag? Whatever the choice, I’m already enjoying having this new pillow in the house. The other two pillows are still in process, but I couldn’t wait to share them with you. The Smålandsväv sample was woven in a few hurried hours in May of 2016 and though it is filled with even more imperfections than the Damask, I still love it. I delight in the memories of weaving it while hearing the creek babble and the birds sing at the farm studio at Vävstuga. I hand-sewed the ends together that make it look like part of the Smålandsväv pattern to give a more complete look on the center back. The fabric is not quite square, so I’m pinning it in various ways to decide how I’ll finish the ends. It will be stuffed with balsam shavings to keep that winter smell alive in the house. The third pillow is a wool deflected double weave sample also woven in May of 2016 with Lisa Hill at Vävstuga’s Water Street Studio. I looked and looked for a fabric that I could place on the back of this square but found nothing suitable. And then while playing with the fabric, I had the idea to roll it over a bottle of my favorite Gerolsteiner mineral water to create a bolster look. I haven’t yet decided how to finish the ends, but I plan to fill it firmly with organic wool pellets created for filling pillows. If you have ideas for the ends, do let me know. I need the balance of bright reds to warm up the shiver of this winter! Last summer I wove the thrums leftover from a blanket I wove for one of my daughters in 2013. Now those thrums have become a pillow cover for a lavender-filled pillow made from some left over handwoven cottolin. It feels great to put these leftovers together and create something beautiful that will be held and enjoyed with the delight of calming lavender. To go along with the wool/lavender pillow, the three of us made beautiful paper stars to bring the light inside during the cold winter days. I love the way the sun shines magically through the stars. May you find ways to keep warm this winter too! Happy New Year * 2019! Here’s my holiday gift to myself – a Smålandsväv scarf! On the loom, off the loom, and tied to the loom between the scarves I wove for my daughters. New Year’s Eve Tradition – Family Fun, Food and Creativity! Playing a memo game from and about Tübingen, Germany, cauliflower latkes, gluten-free German lebkuchen, , a New Year’s watercolor inspired by William Morris embroidery. Textiles of India – Cincinnati Museum of Art – What a treat!!! May your year be filled with artistic endeavors, love, joy, nature, songs and laughter! Last weekend I delighted in visiting eight weavers as part of the Second Annual Working Weavers Studio Trail in Western Massachusetts. The weavers prepared trail maps, detailed directions and a studio passport to have stamped at each location, with the possibility of winning a handwoven item upon visiting 6 of the 8 weavers. My daughter and I delighted in the drive that wound through the beautiful autumn country roads of New England. At each studio we reunited with old friends and teachers, while also making new friends, and concluded that weavers and textile lovers are a happy, friendly bunch. As you can imagine, each weaver has their own style, color palettes, design elements, and genres of weaving. Their studios are filled with the results of creativity, blended with countless hours of diligence. Like the local farmers at your farmer’s market, these weavers are welcoming others into their studios to see where textiles are made right in their own communities. They are a skilled group of artists who are professional weavers. And they are making cloth visible again. Below is a collage of each studio stop in the order we visited. I hope you enjoy this mini-tour and encourage you to visit the Working Weavers Studio Tour website and facebook pages for more information and photos! Wool & Weft requested “no photos”. However delighting and talking about fiber and textiles were definitely welcomed! My trip to MA for the Working Weavers Studio Trail had been in the planning for over a year, and I was thrilled to have my daughter, who is living in MA accompany me along the trail. Here we are at the end of the day – happy, hungry and oh, so very inspired! p.s. I can’t resist telling you that the grass we were standing on and the car parked upon is mixed with herbal thyme and we delighted in the delicious fragrance of each and every step! The Michigan Weaver’s Guild meets once a month in Southfield, MI, which despite the name is just north of the city of Detroit. I was honored and delighted to present Väv Immersion: Sixteen Weeks of Textile Heaven”. Sharing about my experiences at Vävstuga opened all the memories once again. From the excitement and anxieties of the first week of class, the thrill of camaraderie, the intellectual challenges of design and fiber analysis, the accomplishment of finishing project after project, and the awe of the amazing instruction provided by Becky Ashenden and friends all came wafting back into my soul. The table was filled with 16 weeks worth of weaving, plus a few projects Post-Vävstuga. After the presentation the weaver’s gathered around to look, feel and experience the various fibers, textiles and class note books. They shared their stories, ask questions and spoke of their creative aspirations. I was delighted to see the last slide of the presentation in this photo as one of the weaver’s shared her textile dreams. Photos by my husband, Daniel Corwin. Description: Inspired by Marion Tuttle Marzolf’s historical novel Shuttle in Her Hand: A Swedish Immigrant Weaver in America, Tammy Renner dreamt of finding a residential weaving school where she could totally immerse herself in textiles. At that same time, Becky Ashenden, a graduate of Sweden’s Sätergläntan Institute of Handwork and known for her Vävstuga School of Swedish Weaving in Shelburne Falls, MA, imagined recreating the class she experienced in Sweden. In February 2016 their dreams merged with Tammy becoming one of six students in Becky’s inaugural Väv Immersion class. Tammy will share her stories, highlights, and notebooks from her sixteen weeks in “textile heaven” as well as samples of Swedish textiles. Tammy Renner– Throughout her childhood, Tammy found people to guide her as she learned to make potholders, knit, crochet, sew, embroider, garden, weave pine needle baskets and macramé. She enrolled in her high school’s textile arts class and won two top sewing awards at the school fair. Not knowing one could study textile arts as a profession, Tammy studied the other joys of her life – music, folk dance and elementary education. Over the years she has shared her love of life, music, and textiles with children, parents, families and her peers. 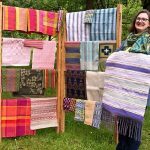 After a trip to Scandinavia in 1999, she purchased her first loom, began weaving linen dishcloths and selling them at the Weavers Guild of Miami Valley’s Winter Sale in Yellow Springs, Ohio. While attending Vävstuga’s first 16-week Väv Immersion School in 2016, Tammy wrote a detailed blog to share with her family and friends who helped her to follow her dreams. Her blog tammyweaves has been read by thousands of weavers in the U.S. and around the world. Tammy lives in Ann Arbor, Michigan where she delights in weaving, teaching, gardening and encouraging others to live their dreams. 11:30 PM Social Time – light refreshments. Bring your own bag lunch if you want. June and July – A Summer of Bands – Thin bands, thick bands, a pattern band and bands mixed with embroidery to repair handles of a favorite shopping bag. July – Indigo Dye is so much fun with a group of friends! A 20 year old silk scarf was redyed in a graduated fashion, new cotton yarn took on a bright indigo and a faded green linen tunic has a new life with indigo! August – A happy garden sings of the final days of summer and of cooler weaving days ahead.